Reading proficiency is vital at this stage because it’s an essential skill both in and out of the classroom. The main problems are not every child is at the same reading level, nor do all children learn at the same rate, nor do they all have the same level of support to encourage reading at home. As a result, some kids excel while others fall behind. English is a melting pot of different languages and a result, we’re left with thousands and thousands of words. Authors may choose to stick with a basic vernacular but as children reach for newer, more mature books, they will no doubt stumble upon words they don’t know or understand. But this is a good thing! It gives students an opportunity to ask questions and practice reading comprehension by examining nearby language for context clues. Help students expand their vocabularly by encouraging them to ask questions or having them make a list of words they don’t understand. Students can then lookup their definitions online or in a dictionary! Make it fun by picking a “Word of the Day” or creating a classroom dictionary for words that multiple students struggle to define. You can also use flashcards, fill-in-the-blank activities, or these vocabulary mini games to make learning new words exciting and memorable! The easiest way for students to develop a habit of reading is to be a reader yourself, and ask parents to model reading for fun. Children mimic what they see. When a child––even a pre-teen––sees their mom or dad sit down with a book, it may inspire them to do the same. As a teacher, pick up a book while your students take tests or as they come back from lunch. Ask parents to read at home. Encourage group discussions. Start a classroom library of your students’ favorite books. Design a chart for them to recommend books to their friends. The possibilities are endless! Does this tip sound familiar? That’s because the same tip can be applied to reading aloud to younger children! Children enjoy themselves more when they don’t feel forced. Let students pick their own books to read. This allows them to choose diversified topics that resinate with them. 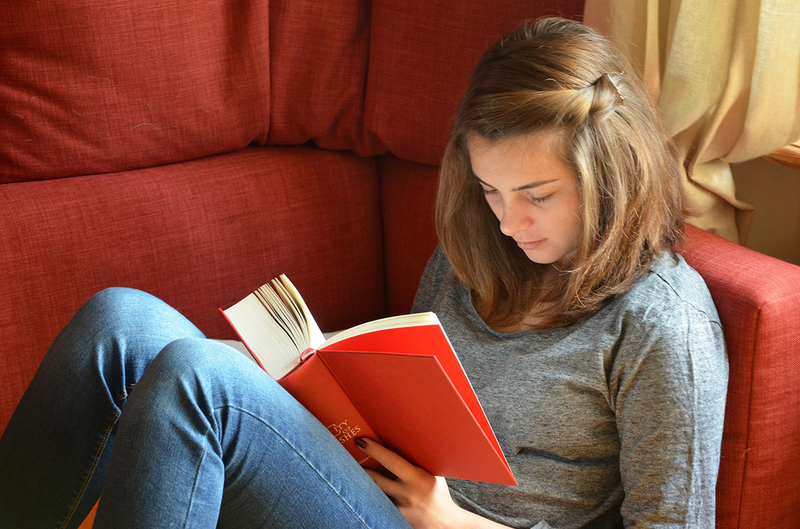 Students at a higher reading level can pick more advanced books. For students who aren’t as fond of reading or who struggle with reading comprehensions, suggest graphic novels as a compelling alternative. Practice makes perfect. In-class readings give you the opportunity to let students “drive the bus.” Invite your students to read a page or two. Let students act out their favorite scenes. Some may be nervous at first but the more students read aloud, the easier it will become for them, thus boosting their confidence in their own reading ability. Let your students put their reading comprehension skills to the test by inviting them to craft alternative endings to their favorite books or to write their own short stories. Students can show off their new vocabulary skills and create characters that reflect their own personal hopes and dreams for the future. In my “I Love To Read” assembly program, I highlight not only how useful reading is in daily life but also how necessary it is to have a rewarding and fulfilling life. This assembly teaches middle schoolers different genres of books, the difference between non-fiction and fiction, biographies and autobiographies, the functions of punctuation, and so much more!